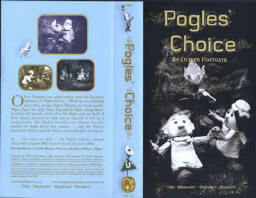 Oliver Postgate was asked which were his favourite episodes of Pogles Wood ?.. whilst he was thinking about this, young Pippin chirped up with his favourite: 'Paper Tigers!' he said, then Tog said that he liked 'Strong Music' in which he was the hero, then Mr Pogle said he liked 'A Little House' because he had always fancied to live in a real house. Mrs Pogle's favourite was 'Flowers' but she needed to think about her answer, and the Plant's favourite ? 'Bricks' said the plant, and would give no reason. 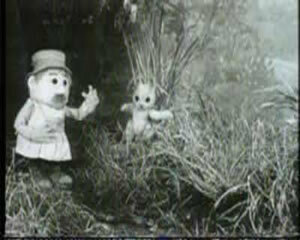 This was the first series - 6 x 10 minute episodes - which tells the story of how the Magic Plant came to live with Mr. & Mrs. Pogle.... and also reveals the truth about Pippins identity as the foundling son of the King of the Fairies. 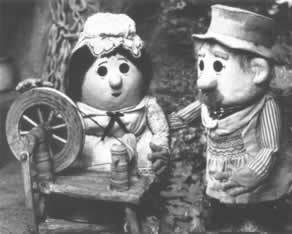 However... the story centres around a very dark and evil old shape-changing Witch.. and is so scary that after broadcasting the series once - the BBC declared it 'too frightening'.. and so since 1965 is has lain undisturbed and unseen by all..... until now. Be warned.. it IS frightening ! Tog has lost his scarf. they go and look for it and see a horse being shod, and a man ploughing with a horse. they find Tog's scarf which my twins (now 40 yrs old !) have tied to their sign. 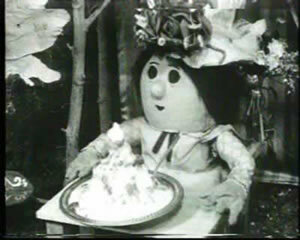 Tog is presented with a cake, so he and Pippin plough a piece of ground and sow cake crumbs to make cake trees. The hedge hog follows them eating the crumbs. After much waking-up banter, the Plant tells a story especially for Mrs Pogle. as requested, this is about a good beautiful princess who lived in a Palace (he interpolated the fact that she was also a kleptomaniac). The Princess's nanny puts paid to that by stealing her pet monkey, but not till complete chaos has been caused and the Butler incarcerated. Pippin doesn't understand why he is lucky to be brought up in a wood. 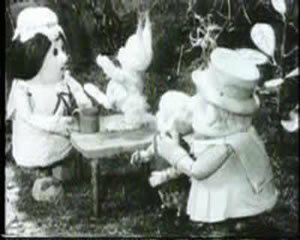 While Mr and Mrs Pogle have gone visiting, Pippin and Tog try to make her a garden table and chair for her birthday. They fail. The Plant tells them a story about a very poor carpenter who is lucky enough to be commissioned by the Queen to make a table and a chair. Unfortunately he falls asleep, so the tools have to make it for him. The Queen is delighted, gives him gold. The magic has, of course, made the real table and chair. They set the Bandstand awning around it. 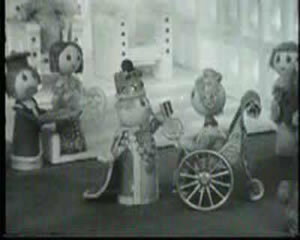 Mrs Pogle returns and they have music and strawberry ice- cream.